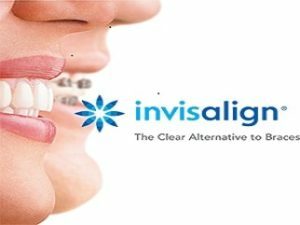 Invisalign treatment Brisbane - Free initial consultation. Invisalign invisible braces uses a series of clear, customized, removable appliances called aligners to straighten your teeth. Aligners doesn't use traditional wires or brackets, instead it uses a series of clear, removable plastic trays – called aligners – to straighten teeth. The aligners are numbered and are worn in a designated order. As you continue the treatment process, your teeth will gradually begin moving to their new positions. As treatment progresses, they become straighter and straighter over time. Aligners are taken out to brush, floss, eat, play sport or to attend that special occasion. It’s virtually unnoticeable so you can always feel confident showing your smile off and knowing that almost nobody will know that your straightening your teeth. For optimum results, the aligners are worn 22 hours each day. You just change your aligners every one- two weeks, until your treatment is complete. Just like braces, the overall treatment time can vary depending on the treatment needed. Some of our patients can have straight teeth in just 3 months, others upwards of two years. For the average person, treatment is approximately 9-12 months. Aesthetics: Most people won't even know that you are straightening your teeth and the aligners can be removed for any social occasion. Unlike metal or clear braces, Invisalign aligners are completely clear. Hygiene: As the aligners are removable, it allows for tooth brushing and flossing. 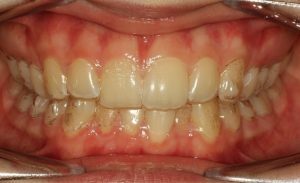 This means less buildup of plaque or calculus during treatment as well as less gingivitis. Unlike traditional braces that are fixed to your teeth. Comfort: No brackets or wires means less ulcers and irritation to your lips and gums. Aligners are made from a clear BPA free medical grade plastic. They are removed for eating and drinking so there is no need to change your diet. 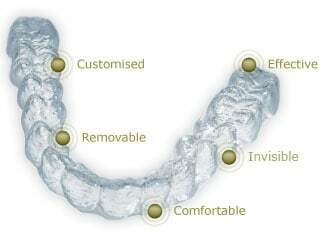 Customised: Each aligner and treatment is custom made for your teeth. We can even show you your future smile before you even start using the hi-tech clincheck technology. Read more facts about Invisalign here! Invisalign has now been used on more than 4 million patients worldwide to transform their smile. Treatment can be performed on adults and teens to improve their smiles without the look and feel of traditional metal or clear braces. While clear braces are less noticeable than normal metal braces, they can still irritate the gums or cheeks with wires and brackets. Because aligners are removable, it allows easier brushing and flossing. This means less chance of tooth decay, or unsightly white spots or decalcification after treatment. Easier tooth brushing also means less chance of bleeding gums or gingivitis. Whilst Invisalign treatment can be performed on most patients, there are some orthodontic problems that are best treated with traditional braces. With any orthodontic treatment, our Orthodontist will outline the advantages and disadvantages of each treatment option. Invisalign now offers a number of products such as Full treatment, Teen, Lite and i7 based on your exact treatment needs. Whether you need a 6 month treatment or require a more complex treatment taking 24 months, we have the treatment for you. You can arrange a free initial consultation for your Invisalign treatment at one of our two locations across Brisbane. Our practices are located at Capalaba and Cleveland and are easily accessible to the Redlands and surrounding areas. Please fill in the contact form below or call us on 07 34880002 to arrange your free initial appointment today. Your mouth is always exposed to dental plaque and a number of different types of bacteria. This means that your aligners are exposed to the same plaque and bacteria also. This is why it’s important to thoroughly clean your aligners. We recommend brushing your teeth after every meal and you should also brush your aligners, this will ensure no plaque or food is trapped. We recommend using a soft toothbrush and regular toothpaste. Brush your aligners just as you would brush your own teeth and rinse them out thoroughly with cold water afterwards. You need to be careful that your aligners where they are exposed to hot water or high temperatures. The aligners are made of a plastic resin and they can distort if exposed to high temperatures. If this occurs, it can cause the aligners to not fit correctly. To ensure your aligners don't get exposed to excessive heat, you should make sure they are not rinsed in hot water, left in a hot car or that you don't drink anything that’s too hot while your aligners are in. We advised that you only drink water with your aligners in place. There are a number of circumstances each day when you’ll be taking out your aligners. For example, you’ll take them out when you’re eating, cleaning your teeth, attending that special occasion, playing sports or drinking anything except water. In these circumstances, it’s important to keep your aligners out of harms way. This is why we provide you with two cases for your aligners. By keeping your aligners in the case, you’ll be much less likely to lose or damage your aligners.